Ask most women whether they have the right to equality at work and the answer will be a resounding yes, but ask the same women whether theyd feel confident asking for a raise, a promotion, or equal pay, and some reticence creeps in. The statistics, although an improvement on previous decades, are certainly not in womens favour Â of 197 heads of state, only twenty-two are women. Women hold just 20 percent of seats in parliaments globally, and in the world of big business, a meagre eighteen of the Fortune 500 CEOs are women. 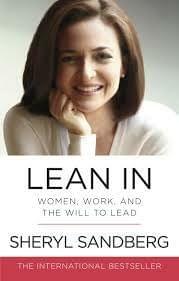 In Lean In , Sheryl Sandberg Â Facebook COO and one of Fortune magazines Most Powerful Women in Business Â looks at what women can do to help themselves, and make the small changes in their life that can effect change on a more universal scale. She draws on her own experiences working in some of the worlds most successful businesses, as well as academic research, to find practical answers to the problems facing women in the workplace. Learning to lean in is about tackling the anxieties and preconceptions that stop women reaching the top Â taking a place at the table, and making yourself a part of the debate.